In Nichia Corp. v. Everlight Americas, Inc., [2016-1585, 2016-1618] (April 28, 2017), the Federal Circuit affirmed the district court’s judgment that U.S. Patent Nos. 8,530,250, 7,432,589, and 7,462,870, directed to LED devices, were valid and infringed, as well as the district court’s denial of a permanent injunction. The Federal Circuit affirmed the district court’s construction of “lead,” rejecting the argument that it should have been construed to mean “the conductive portion of the device that makes an electrical connection to a structure outside of the device” rather than “the portion of the device that conducts electricity.” The Federal Circuit also affirmed the district court’s construction of “planar,” rejecting the argument that it should have been construed to mean “no measurable surface variation,” rather than “in a substantially same plane.” Thus the Federal Circuit affirmed the finding of infringement. With respect to validity, the Federal Circuit found substantial evidence supported the district court’s conclusion that some of the references asserted were not analogous, that claim elements were missing from other references, and that there was a lack of motivation to combine, and thus that the patents were not proven obvious. As to Nichia’s appeal, the district court held that Nichia failed to show that it had suffered irreparable harm and that remedies at law provided Nichia inadequate compensation. The Federal Circuit agreed that Nichia failed to show irreparable harm, and thus did not reach the adequacy of compensation issue. The Federal Circuit said that an injunction in patent law must be justified like any other: the moving party must satisfy the court that relief is needed. Applying “well established principles of equity” the Federal Circuit found the showing of irreparable harm lacking. The district court noted the absence of meaningful competition between the parties. The district court also found that Nichia had failed to establish past irreparable harm, or the likelihood of irreparable harm in the future based on lost sales” or “based on price erosion.” The district court further found that Nichia’s licensing of the patents to major competitors suggested that harm from “infringement of the patents-in-suit is not irreparable.” Finally, the district court found that Nichia’s licensing practices have made multiple low-priced non-infringing alternatives from competitors available to replace the accused Everlight products if such products were not available. The Federal Circuit deferred to the district court because the court heard these arguments as the original finder of fact and concluded to the contrary, carefully weighing both parties’ evidence. The Federal Circuit agreed that that parties sold in different markets, and Nichia failed to prove that any competition between the parties was meaningful. The Federal Circuit noted that Nichia failed to show the infringement was the “but for” cause of even one lost sale, or the “but for” cause of price erosion. The Federal Circuit rejected a rule that the patentee’s licensing activities automatically barred injunctive relief, but had no problem with considering licensing activities as a factor. Because Nichia failed to establish one of the four equitable factors, the court did not abuse its discretion in denying Nichia’s request for an injunction. It is interesting that principles of equity can defeat the Constitutionally established “exclusive rights” to inventions and discovery, yet principals of equity are insufficient to extend laches to patent cases. for building a composite facial image using constituent parts was directed to the abstract idea of encoding and decoding image data. whereby a user displays images on a first display, assigns image codes to the images through an interface using a mathematical formula, and then reproduces the image based on the codes. The Federal Circuit rejected the argument that, like the claims in Enfish, the claim was being parsed at too high a level of abtractions. The Federal Circuit found Digitech Image Technologies more analogous. “transforms” the abstract idea of encoding and decoding into patent-eligible subject matter. The Federal Circuit said that claims that are directed to a nonabstract idea are not rendered abstract simply because they use a mathematical formula, but that the converse is also true: A claim directed to an abstract idea does not automatically become eligible merely by adding a mathematical formula. IPR Estoppel: Ripe for Gamesmanship? As to the instituted grounds, these are clearly estopped. As to the grounds petitioned but not instituted, after weighing the competing policy considerations, the court concluded that these were not estopped, citing Verinata Health, Inc. v. Ariosa Diagnostics, Inc., No. 12-cv-5501, 2017 WL 235048, at *3 (N.D. Cal. Jan. 19, 2017) (collecting cases). Finally with respect to the grounds not petitioned, the court concluded that these were grounds that could have been raised, and thus were estopped. The Court cited SAS Inst., Inc. v. ComplementSoft, LLC., 825 F.3d 1341, 1354 (Fed. Cir. 2016) (Newman, J., dissenting), as well as Precision Fabrics Grp., Inc. v. Tietex Int’l, Ltd., No. 13-cv-645, 2016 WL 6839394, at *9 (M.D.N.C. Nov. 21, 2016); Clearlamp, LLC v. LKQ Corp., No. 12-cv-2533, 2016 WL 4734389, at *8 (N.D. Ill. Mar. 18, 2016). The impact of this decision, is that the PTAB’s decision not to institute on a particular grounds actually hurts the patent owner, because estoppel does not apply. A patent owner would be much better off if the ground were instituted, and denied. Then, the challenger could not re-raise the grounds in court. While the district court’s decision that the grounds that were not included in the petition were grounds that “could have been raised” and thus estopped, this determination creates a perverse incentive for patent challengers. A patent challenger is much better off including these grounds in the IPR petition, perhaps in a way that essentiall guarantees they won’t be instituted, thereby insulating these grounds from the application of estoppel. The district court noted that it is not bound by a refusal to institute, and while it will consider the PTAB’s reasoning “to the extent it is persuasive”, if the reason for not instituting is that the grounds were not completely developed, a district court likely would allow the challenger not only to re-present the grounds, but to more fully develop it. While the PTAB has the discretion not to institute an IPR, when they do so, they aren’t doing any favors for a Patent Owner. The PTAB should liberally institute IPRs on the grounds that challengers present. 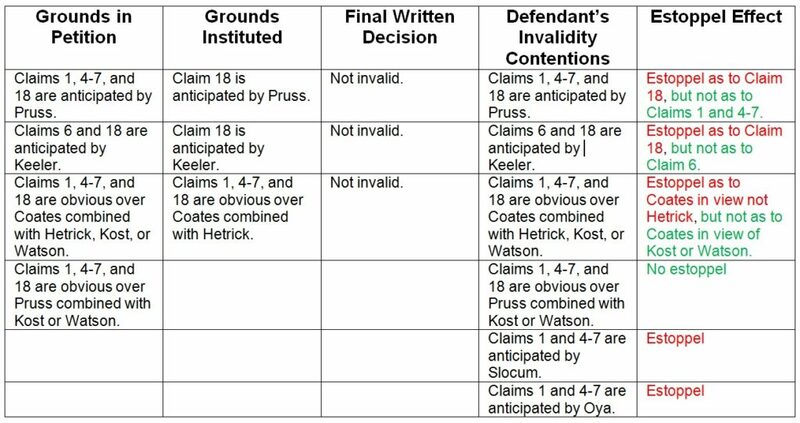 Denying the grounds in the final written decision instead of the institution decision better protects the Patent Owner. Little Words That Can Make a Big Difference: i.e. Versus e.g. A patentee’s use of “i.e.,” in the intrinsic record, however, is often definitional. Edwards Lifesciences LLC v. Cook Inc., 582 F.3d 1322, 1334 (Fed. Cir. 2009) (“[U]se of ‘i.e.’ signals an intent to define the word to which it refers.”); see also Abbott Labs. v. Novopharm Ltd., 323 F.3d 1324, 1330 (Fed. Cir. 2003) (holding that a patentee “explicitly defined” a term by using “i.e.” followed by an explanatory phrase). The Federal Circuit explained that “the term ‘i.e.’ is Latin for id est, which means ‘that is.’” The Federal Circuit added that whether a statement to the PTO that includes “i.e.” constitutes a clear and unmistakable disavowal of claim scope depends on the context, citing Braintree Labs., Inc. v. Novel Labs., Inc., 749 F.3d 1349, 1355 (Fed. Cir. 2014). Samsung pointed to instances were i.e. was found not to be definitional, such as where it would be internally inconsistent as in Pfizer, Inc. v. Teva Pharm., USA, Inc., 429 F.3d 1364, 1373 (Fed. Cir. 2005) or where it would read out preferred embodiments, as in Dealertrack, Inc. v. Huber, 674 F.3d 1315, 1326 (Fed. Cir. 2012). But the Federal Circuit did not agree that interpreting “i.e.” as definitional, as it normally is, would result in inconsistency. The Federal Circuit said that given a lone example, rather than a definition, a skilled artisan is still left to wonder what other forms of display are unobtrusive and non-distracting. The Federal Circuit concluded that the phrase “unobtrusive manner that does not distract a user” was indefinite. In Rembrandt Wireless Technologies, LP v. Samsung Electronics CO., LTD., [2016-1729] (April 17, 2017), the Federal Circuit affirmed the district court’s claim construction and denial of JMOL, but vacated $15.7 million in damages and remanded because of a lack of patent marking. In affirming the non-obviousness determination, the Federal Circuit rejected Samsung’s argument that it was a claim construction issue of the scope of “different types,” and characterizing it as a factual question of whether the reference disclosed “different types” of modulation. The Federal Circuit found that there was substantial evidence to support the jury’s presumed finding underpinning the non-obviousness determination. Rembrandt’s argument that any prior obligation to mark products embodying claim 40 vanished once it disclaimed claim 40. In the event of failure so to mark, no damages shall be recovered by the patentee in any action for infringement, except on proof that the infringer was notified of the infringement and continued to infringe thereafter, in which event damages may be recovered only for infringement occurring after such notice. either constructive notice through marking or actual notice. The Federal Circuit added that allowing Rembrandt to use disclaimer to avoid the consequence of its failure to mark undermines the marking statute’s public notice function. While a disclaimer can disclaim the rights of the patent owner, the Federal Circuit said it has never held that a patent owner’s disclaimer relinquishes the rights of the public. Considering the rights held by the public, the Federal Circuit held that disclaimer cannot serve to retroactively dissolve the § 287(a) marking requirement for a patentee to collect pre-notice damages. Before the district court, Rembrandt argued, consistent with its disclaimer position, that the marking requirement is determined on a claim by claim basis, rather than on a patent-by-patent basis. The Federal Circuit left this question for the district to determine in the first instance on remand. In Phil-Insul Corp. v. Airlite Plastics Co., [2016-1982] (April 17, 2017), the Federal Circuit affirmed summary judgment of non-infringement of U.S.
Patent No. 5,428,933. In prior litigation in which Phil-Insul asserted the patent against a different defendant, the district court construed the claims, granted summary judgment, and the Federal Circuit summarily affirmed. In the present action, Airlite successfully argued to the district court that the accused products have the same design as the products found noninfringing in the prior litigation. The district court agreed, and granted Airlite’s motion for summary judgment of noninfringement. Airlite raised collarateral estoppe, and Phil-Insul countered that (1) it did not have a full and fair opportunity to litigate the issues in the prior litigation because it now alleges infringement of Claim 2, rather than Claim 1; (2) the district court’s claimconstruction in the prior litigation was incorrect; and (3) the defense of collateral estoppel is not available in this case because the claim construction was not essential to the court’s noninfringement rulings. further found that the infringement issues were “essentially indistinguishable” from those in the prior litigation, and that the accused Airlite products have the same design as the products in the prior litigation. defendant.” The Federal Circuit said that regional circuit law applies to the application of collateral estoppel, but Federal Circuit law applies to aspects peculiar to patent law. In particular in determining whether a later infringement claim is the same as an earlier claim, the products must be “essentially the same,” in other words the differences between them are merely colorable or unrelated to the limitations in the claim of the patent. address each argument in turn. The Federal Circuit found that a Rule 36 affirmance is a valid and final judgment, and can support claim or issue preclusion. As to the reliance on oral argument transcript, the Federal Circuit found that district court did not err in relying on the transcript to confirm the scope of what was at issue in the prior litigation. Finally, as to the need to construe claim 2, the Federal Circuit first noted that the parties selected the terms and the claims to be construed, so Phil-Insul complaint is without merit. The Federal Circuit further noted that claim 2 contains the same terms “adjacent” and “dimension” terms that the court construed in the prior litigation, and that these terms were dispositive, and noting that it is well-established that claim terms are to be construed consistently throughout a patent, citing Rexnord Corp. v. Laitram Corp., 274 F.3d 1336, 1342 (Fed. Cir. 2001). In The Medicines Company v. Mylan, Inc., [2015-1113, 2015-1151, 2015-1181] (April 6, 2017), the Federal Circuit affirmed summary judgment of non-infringement of U.S. Patent No. 7,598,343, and reversed a bench trial determination of infringement of U.S. Patent No. 7,582,727.
consistency. The Federal Circuit noted that the patent owner agreed that Medicines agrees that batch consistency is the result of following the patents in suit and is what distinguishes them from the prior art. The Federal Circuit found a claim construction that covered any process that achieved the impurity standard and was not limited to the disclosed “efficient mixing” was unworkable, because an infringer would not know whether it infringed until all of the batches were completed, and thus would not provide reasonable certainty regarding the claim scope. This reasoning seems faulty because if the infringer used a process which, like the disclosed process, reliably achieved the claimed impurity level, there would be no uncertainty. Finally the Federal Circuit noted that the patent owner distiguished the invention to the district court based upon the process disclosed in the specification, telling the court that it was readily apparent that the definition of pharmaceutical batches refers to the compounding processes described in the patents-in-suit. After a detailed review of the language of the specification, the Federal Circuit found that the specification teaches efficient mixing as a necessary and sufficient condition for achieving batch consistency, and the prosecution history confirms that achieving batch consistency requires efficient mixing. The Federal Circuit concluded that to attribute to the claims a meaning broader than any indicated in the patents and their prosecution history would be to ignore the totality of the facts of the case and exalt slogans over real meaning. The Federal Circuit went on to find that the required “efficient mixing” was not met by the accused products, and reversed the district court’s finding of infringement.